Linda and I went to Hye Sook Park’s exhibition of paintings, “Work in Progress,” at the Love Gallery in Wrightwood on Saturday evening. There were a number of paintings leaning against the wall. A huge pair of canvases, each one probably about eight feet high and more than 10 feet in length, radiated a glow worthy of Lee Mullican. Entitled “California,” the diptych was joined in the center by a left and right hemisphere of solar density. The solar winds swirled outwards with a palpable beneficence. If anyone’s brushstrokes could prove an incantation to dissolve the ongoing drought, then Hye Sook Park’s painting might at least start the process. Another painting, on the floor directly in front of the right half of “California,” showed the face only of a prone figure, isolated from the vast trajectory of stars burning without the aura of mythic constellations; here was an image of human consciousness unable to reconcile its ability to discriminate on a microscopic level and the perceptual capacity to calculate and gauge the exponentially expanding universe. The figure was calmly distraught, or so the coloring hinted, and yet distress was pushing against the facial surface. A more buoyant picture was leaning against the wall directly across the wall from California. “The Fall of St. Paula” was upside down, but the joyous ripples of colors across the skirt of a dancer seemed to suggest a moment of gleeful redemption. I hope to see that painting in its completed form before it finds its home in some collector’s private study, not to be seen again for many, many years. The last large painting that caught my eye was “Merry-Go-Round,” a photograph of which was taken by Linda and inserted into this post. 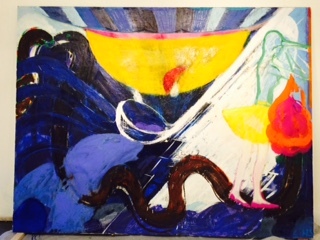 It featured snake-like creatures writhing underneath and to the rear of a bird-like figure, who is evocative of the creatures in Bosch’s “Garden.” Hovering at the edge of some unseen residue of exhausted yearning, she has somehow been purified by a long night of ferocious, inner choreography. A huge ladle juts behind her, representing both the cross she must carry into her exile and the cup out of which she drank during her nocturnal ordeal. Whatever her destiny, perhaps the journey now set out upon will unexpectedly be the best part of eternity for her. The painting takes the audacious risk of tempting us to wish her well. Hye Sook Park paints out of the deep need to test the limits of fate. It would appear that the fashion of contemporary art has overlooked an artist unwilling to compromise. Her underlying hints of fertile delicacy and passionate essences give one pause: could it be that modern man (and I emphasize the male aspect of that word choice) has made far worse choices than it appears. Park’s representations of inner dialogues suggest that radical meditation – something more daring than even Zen would prose – is needed. If such an implicit manifesto has yet to be heeded, then so be it, says Park. The skepticism of the post-modern is far from corrosive enough to daunt the aspirations of genuine artists. Hye Sook Park has no intentions of surrendering to anything less than the inability to pick up a brush. The work indeed is in exhilarating progress. Posted on April 14, 2015 by billmohr. This entry was posted in Painting and Sculpture. Bookmark the permalink.